2018 marks the first year of filing tax returns using 500 plus pages of tax code changes passed into law in late 2017. To help you plan for the new rules, here are the four biggest changes and their potential impact on your return. Tax rates are lower. While five of the seven tax rates drop by 2 to 4 percent, the income ranges of these new rates fluctuate quite a bit. Review where your income now fits using this tax rate chart. Exemptions are gone. The $4,050 income reduction for each exemption is now set to zero. Yes, zero. So your taxable income is now that much higher for each personal exemption you took in 2017. Standard deductions are virtually doubled. 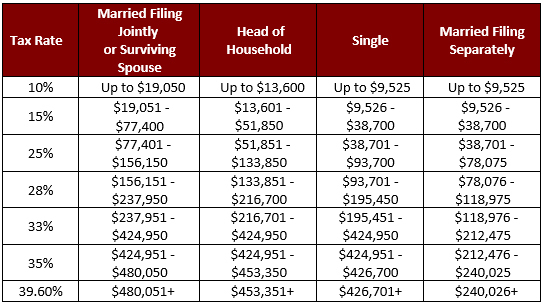 To offset the loss of the personal exemption, the standard deductions are now higher: $24,000 for a married joint filer and $12,000 for single filers. A Child Tax Credit for everyone. The popular Child Tax Credit is now doubled to $2,000 and with higher phase outs. Virtually every taxpayer with a qualified child under the age of 17 will see this credit on their tax return. Everyone will be impacted by the new tax changes. Please be prepared to see these new rules applied to your tax return this year. At Bourke Accounting we are encouraging our clients and prospective clients to come in and see us so we can let you know exactly how this years filing will look. Give us a call at 502-451-8773 or stop by for a visit. See you soon!